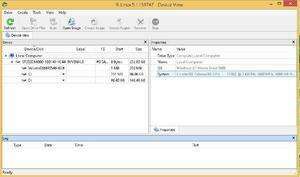 R-Linux is a free data recovery and undelete utility for Ext2FS/3FS (Linux) file system. File recovery after power failure, system crash, virus infection or partition was reformatted, even for the different file system. The utility creates image files an entire disk, partition or its part. Such drive image can be processed like regular disks. For security reasons, you should also check out the R-Linux Free Recovery download at LO4D.com which includes virus and malware tests. Additional screenshots of this application download may be available, too.